Swimming is one of the best total body workouts for your body. Swimming, unlike running (for most people), is easy on the joints and can be fun depending on the type of swimming you are doing. Swimming with friends is a great way to enjoy yourself as well as enhance your physical and mental strength and endurance. This is also a great way to change up your workouts from time-to-time. 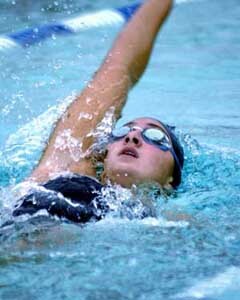 Research has shown that swimming workouts burn approximately three calories a mile per pound of body weight. One mile is 1,609 meters. So for a 150 pound person, at a 30-minute/mile pace, they would burn around 900 calories. Nine hundred calories in a half hour; it takes an hour on the treadmill at a fast pace to burn 900 calories! Below are a few different swimming workouts that you may want to give a shot! Try each stroke for 25 meters: Front Crawl, Breast Stroke, Butterfly, Elementary Back Stroke, Back Crawl, and Side Stroke. Try each of the previous strokes for 50 meters. Try each previous stroke for 25 meters then tread water for 10 minutes and repeat. Tread water for three minutes before performing each stroke for 50 meters. Example: Tread then breast stroke for 50 meters, then tread again before going into the front crawl and so on. Swim Workout 5: Swim for as long as you can without stopping any stroke, plus the dog paddle. If you can only swim for a few minutes at a time, it is alright, just try and increase your swim time next time. It should say…450 calories in a half hour…that is 900 calories in a hour of swimming at 30 mile pace for a 150 pound person (3 calories per pound of weight).